Beer Loyalty Cards are Back!!!!! I think it is very safe to say that Spring has fallen on Melbourne – excluding of course the world famous “Melbourne Weather” installation that is. So with this ace new season upon us, we will once again be rolling out the very popular Beer Loyalty Card. Now it’s no shock or surprise that our regulars are well aware that ALL of the beer in our fridge is cheaper that Old Mate Dan across the street; we haven’t lowered our prices, just that our prices have always been cheaper. It’s just when people see the “Lowest Price Guaranteed” they automatically believe it. Well they’re not. What does the loyalty card involve I hear you ask. 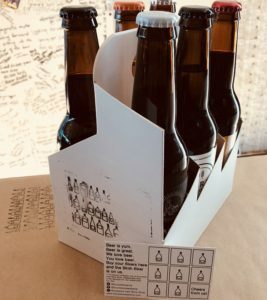 Well all you need to do is come in to the WINE STORE | WINE BAR, purchase either a 4our or 6ixer, get a stamp and on your 9inth purchase we will sling you what we call the Melways 6A – 6 smokin hot locally produced craft beers – for free baby!!!!! Whats not to like with that.